A series of art events this month in Shanghai seems to suggest a prosperous contemporary art scene - the third ShContemporary, the warm-up exhibition of the newly born Minsheng Art Museum; the group exhibition Bourgeoisified Proletariat by more than 40 artists; and various cocktail parties for art professionals. But, for people who attended the ShContemporary 09, which closed on Sunday at the Shanghai Exhibition Center, the impact of the world financial slowdown on the contemporary art scene was clearly visible, with only 78 galleries participating, a sharp fall from last year's number of 140. "The impact of the financial crisis on the contemporary art market is far from easing. I think there is still a long way to go," says Sun Ning, director of Platform China, a Beijing-based gallery that participated in ShContemporary 09. A recent Report of the Auction Market for Chinese Art Works released by www.artron.net, one of the most comprehensive Chinese art websites, also paints a bleak picture of contemporary Chinese art. The Artron Contemporary Art 18 Index, which is based on the turnover of 18 of the most sought-after Chinese artists such as Zhang Xiaogang, Liu Xiaodong and Zeng Fanzhi, has dropped 50.7 percent this spring auction season over the same period last year. 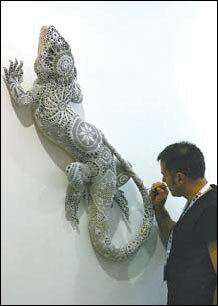 A foreign artist works at the Shanghai Exhibition Center to complete his exhibit for the third ShContemporary. 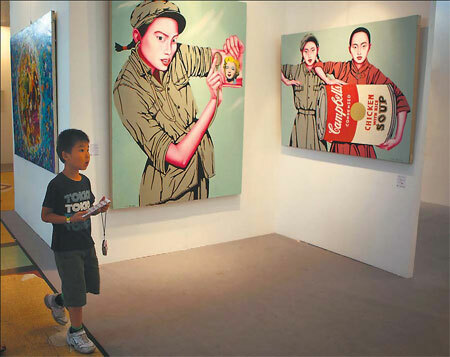 The downturn in the market for contemporary Chinese art came in the second half of last year. At the Sotheby's Hong Kong auction on Oct 4 last year, five pieces by leading Chinese contemporary artists including Zeng, Fang Lijun and Yue Minjun, failed to sell. Although the art market as a whole is feeling the adverse impact of the economic slowdown, contemporary Chinese artworks have experienced the worst of it. The report of www.artron.net attributes this to the market orientation of contemporary Chinese art. In recent years, "oil paintings and contemporary Chinese artworks mostly attract new customers, whose ultimate goal of participating in the auction market is investment or even speculation", the report asserts. "Contemporary art is the most affected sector of all Chinese art, because there has been too much of a bubble in recent years," says Gong Jisui, a professor with the Arts Administration Department of Central Academy of Fine Arts, and former dean of Chinese Paintings and Calligraphy Department of Sotheby's. "In recent years, contemporary Chinese art has become the fastest value-added sector in the history of the art market." The first wave of Chinese art works at auction began with traditional Chinese painting and calligraphy between 2003 and 2005. Since 2005, contemporary Chinese art works began to dominate the market of Chinese art and attract wide attention with their records-breaking prices. In 2006, Liu Xiaodong's Three Gorges: Newly Displaced Population was hammered at 22 million yuan ($3.22 million). In 2007, Cai Guoqiang's Set of Fourteen Drawings for Asia-Pacific Economic Cooperation was sold for HK$ 74,247,500 ($9,577,974). And last year, Zeng Fanzhi's Mask Series 1996 No.6 set a new record for contemporary Chinese art at HK$ 75,367,500 ($9,722,455). Lorenz Helbling, founder and director of ShanghART, the first gallery of contemporary Chinese art in Shanghai, recalls that the first work that ShanghART sold, in 1996, was a painting by Shanghai artist Ding Yi, at the price of a few thousand yuan. Today, Ding's works are often sold for millions of yuan at auctions. "At that time, nobody was paying attention to contemporary art in China," says Helbling, who comes from Switzerland. "People often said, 'What kind of art is this? I don't want this even if it's for free'. Today, they probably won't say so." Colin Chinnery, fair director of ShContemporary 09, attributes the rise of contemporary Chinese art in recent years to the world's growing attention to China. Gong says that on the one side, the upsurge of contemporary Chinese art is a natural culmination of a long-term accumulation; on the other, the collection of contemporary Chinese art works has mostly been investment-driven. "Many investors and institutions who neither understand nor love contemporary Chinese art join the market simply for speculation. This is very dangerous," he says. "To some extent, art collection has become a conspiracy of investors, critics and media." Sun Ning believes that the current adjustment being seen in the art market is a good thing for contemporary Chinese art. "When the speculators are out, the prices will become more reasonable and the market will begin to attract the genuine collectors," she says. For the first time, the ShContemporary has initiated a Collector's Development Program (CDP) this year, with the aim of engaging with emerging collectors in China to create networking opportunities. The program has so far attracted about 250 collectors from Asia, Europe and the United States. "China will certainly become Asia's biggest market of contemporary art in the future, but it is still developing, and we need to help it grow," says Chinnery. Besides showcasing galleries from around the world and initiating the CDP, ShContemporary 09 also presented Discoveries, a curated exhibition to display works by established and rising artists, including Xu Zhen, Shi Qing and Feng Mengbo. Wang Jianwei, a well-known Beijing-based artist and one of the three curators of Discoveries, observes that at a time of economic downturn, artists tend to go low-key and use more day-to-day materials, but this does not prevent them from creating meaningful works. Wang points out that when contemporary Chinese artists emerged in the 1980s, there was hardly any link between art and the economy, and it was difficult to even hold an exhibition, yet many good works were born at time. "What the financial crisis influences is the art market. It won't affect artists' thinking, but will raise new questions for contemporary art to explore," he says.